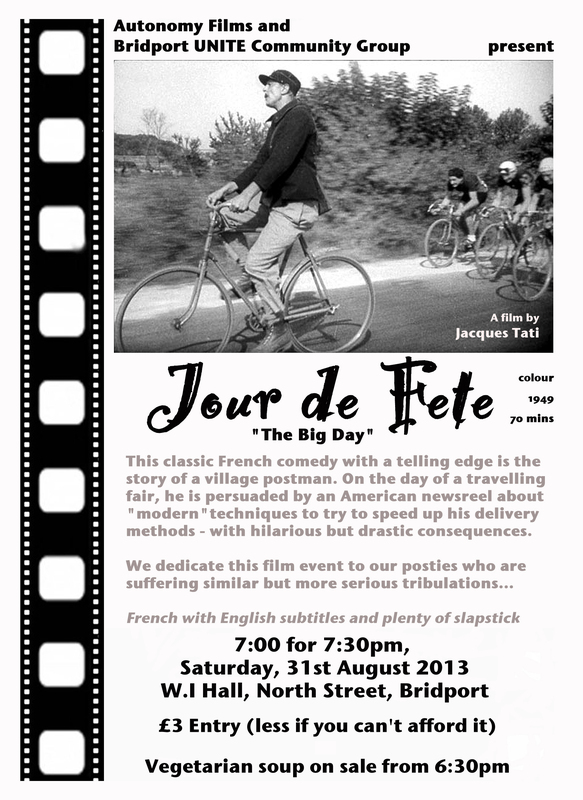 Autonomy film show in Bridport 31st August 2013, in support of Postal Workers. Bridgwater Royal Mail strikes: Stronger than ever after eight days! 110 Bridgwater Royal Mail strikers, out on the gate for their eighth day tomorrow, Saturday 17th, are more determined than ever to secure a decent settlement from their employer. They have also welcomed an intervention on their behalf from Len McCluskey of the Unite union. The Bridgwater postmen and women are in the Bristol Branch of the CWU/Communication Workers Union, which is dealing with scores of local strike ballot requests from all over the country, as the Government prepares for its autumn plan to sell Royal Mail off. Most of these local issues are the same: excessive workloads; a punitive managerial regime that disciplines staff of up to 45 years service for working too slow; finally, managers breaking local and national agreements with the CWU that protect health and safety, earnings levels, and permanent and full-time job opportunities. “Bridgwater lads and lasses on strike have reacted with calm and a quiet determination to an extremely aggressive supervisory regime that has been trying to provoke wildcat strikes for a month or more now. Managers have secretly spied on us, peeked under toilet doors, bullied us out of tea and fag breaks, refused legitimate overtime claims, taken us off our own duties, changed duty start and finish times without agreement, chivvied us in public for not walking or cycling fast enough, threatened temporary contract staff with reductions in hours, and banned and threatened CWU Reps with disciplinary action for performing their legitimate union activities. All this because we dared to challenge an imposed and un-agreed summer ‘savings’plan. Dave Chapple also said: “We especially welcome members of the Unite union to our picket line. Up to 150 members of Unite-Royal Mail managers-have been crossing our picket lines during our last seven strikes days, and attempting to undertake our delivery work: we now understand that Len McCluskey himself has written to all these managers instructing them not to come to Bridgwater to try and break the strike. That’s great news for us! 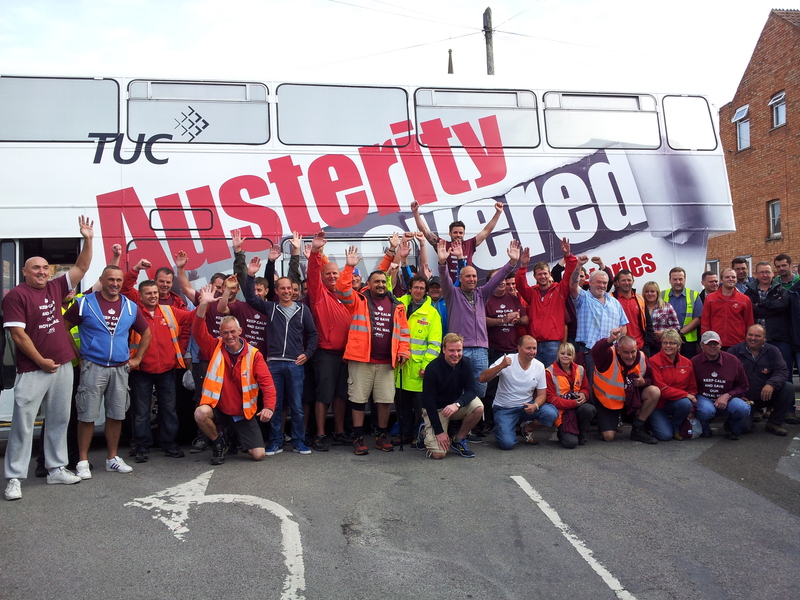 The attached photo was taken on 29th June and is credited to “Exeter TUC”: It shows the TUC anti-austerity bus blocking the Bridgwater Delivery Office gate with 60 pickets! 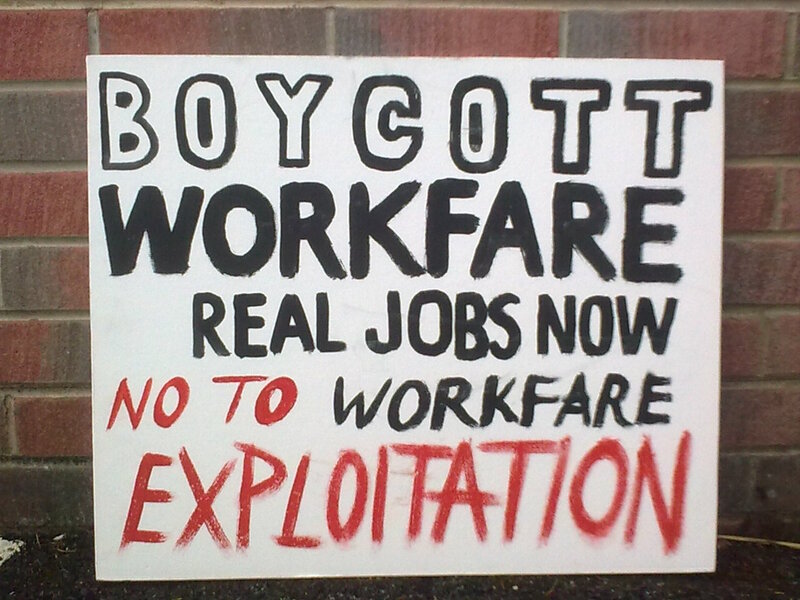 How Do We Break Workfare? – Report from National Conference. Participants came from Liverpool, Norfolk, Oxford, Dorset, London, Surrey and Sussex as well as Brighton and Hove. They represented welfare and anti-cuts campaigns, claimant organisations, political groups and trade unions, as well as many individuals opposed to workfare.